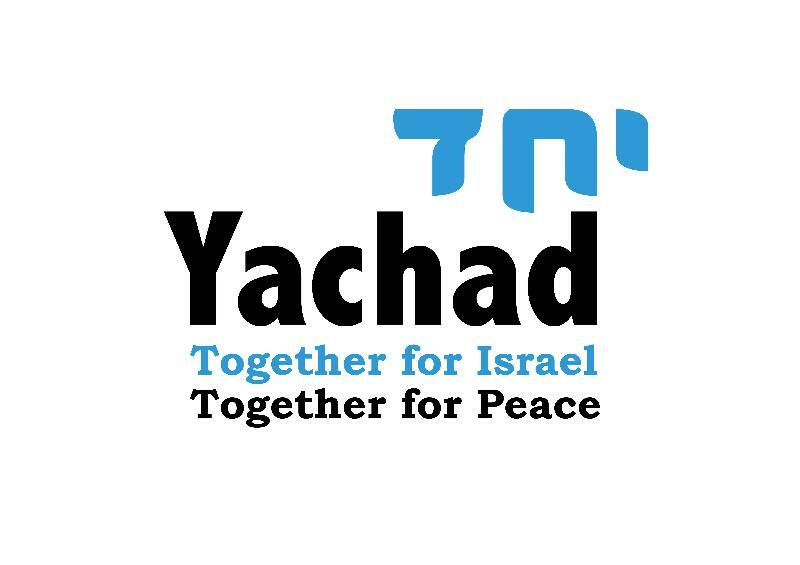 New organisation Yachad describes itself as a “a pro-Israel pro-peace grassroots movement that aims to harness the energy of large numbers of British Jews through education, debate and advocacy in support of the steps needed to create peace and long-term security for Israel”. They have just written a letter to Daniel Taub, the new Israeli Ambassador to the UK, and launched an Ipetition to gain signatures to the letter (see text of letter below). Last night I noticed an automated email thanking me for signing this petition. I couldn’t recall signing it and presumed I must have somehow done it by mistake. Then this morning I got an automated follow-up email from Hannah Weisfeld, a Yachad director, thanking me for signing and asking me to get my friends to sign it and also asking me for money. Looking through the other signatures I noticed Jonathan Hoffman’s name. But he told me that he hadn’t signed it either! I have nothing against Yachad and wish them well in their search for “long-term security for Israel”, but their letter basically amounts to a call for Israel “to end the occupation”. It’s a nice idea in fantasy, but in reality ending “the occupation” would lead to Hamas, with the help of Syria and Iran, unleashing destruction on Tel Aviv, and Israel in general, on a scale unseen for many years. Yachad means well but following their cause won’t achieve anything worthwhile soon. Oh, and please will someone remove my signature from the petition. Thanks. We welcome you to the UK and the British Jewish community. The British Jewish community has a long and proud connection to Israel as the democratic homeland of the Jewish people and we care deeply about its future. Each day without a peace agreement makes this future less secure. We stand behind the cross section of voices inside Israel – including former chiefs of staff, major generals, leading academics and intellectuals – who have spoken in support of a Palestinian state based on 1967 borders with mutually agreed land swaps. We believe the need to create a Palestinian state is urgent, and the best way to safeguard Israel as a Jewish and democratic state with secure and internationally recognised borders. We urge the Israeli government to do everything in its power to make this vision more, not less likely, through taking steps to end the occupation and heeding the calls to return to the negotiating table. We look forward to an ongoing dialogue with you throughout your term of office here and hope you will ensure our message of support is passed to the government of Israel. 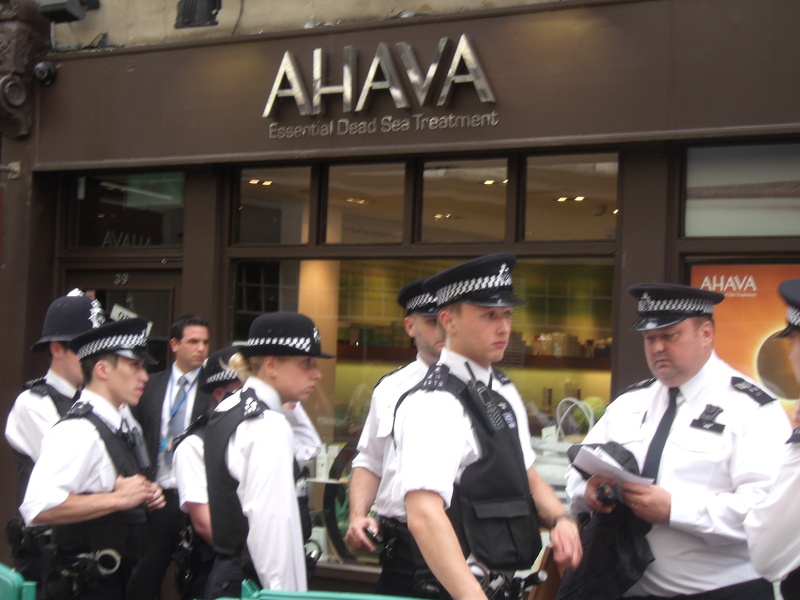 A heavy police presence was required again last Saturday in Monmouth Street, Covent Garden as anti-Israel protesters gathered outside the Ahava shop for the fortnightly ritual of singing anti-Israel songs, parading anti-Israel slogans and giving out anti-Israel literature. 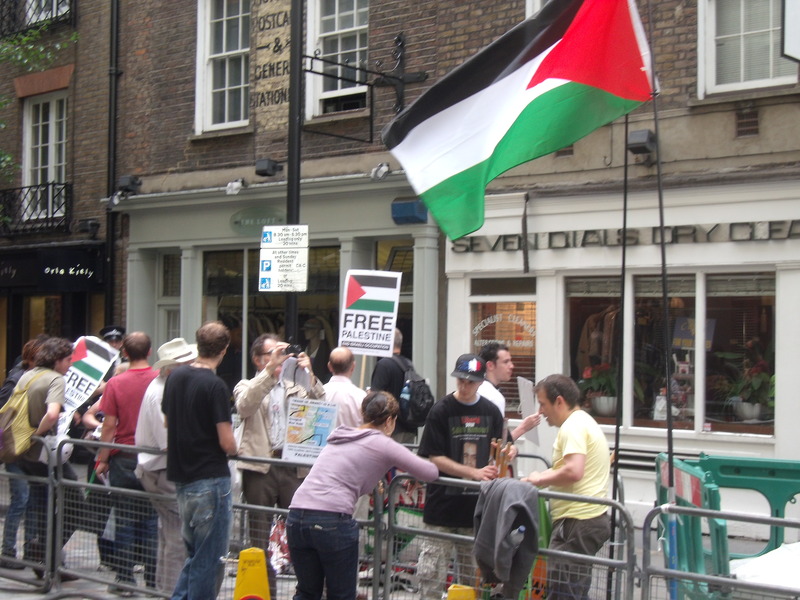 It rounded off a good week for the protesters after David Cameron seemed to hold Israel solely responsible for the suffering of the people of Gaza as well as expecting Israel to allow any ship to enter Gaza unchallenged. 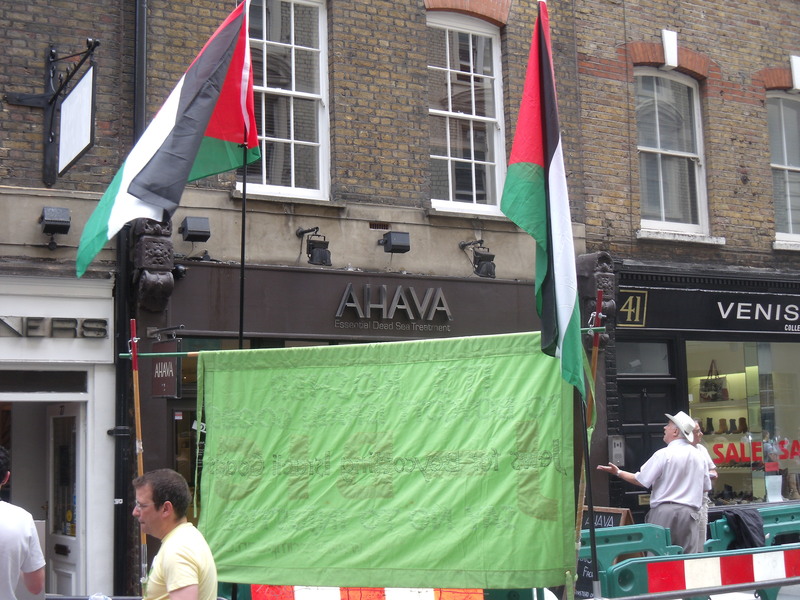 Mindful of the fact that businesses on Monmouth Street are suffering due to these regular protests a small group of pro-Israel counter-demonstrators gave out leaflets which encouraged people to shop there while the anti-Israel protesters continued with their usual leaflets that scream: “Boycott Ahava”. 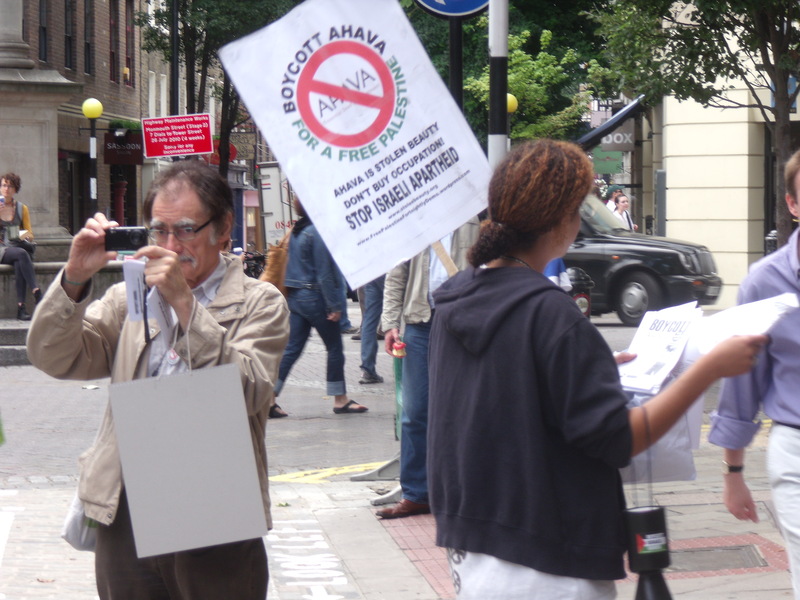 Meanwhile, the next anti-Israel protest outside Ahava is on 14th August from midday. AQSA. AQSA. Read all about it! Available at all good British Universities now. 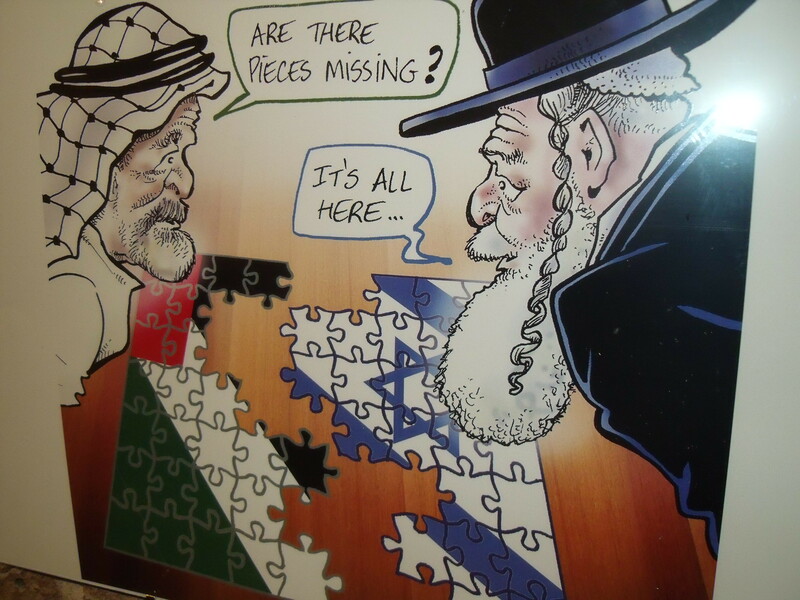 Why read the Jewish Chronicle or the Jewish News, those mere organs of the all-powerful Israel Lobby, when you can get the unvarnished truth about the Israeli-Palestinian conflict from Aqsa News? The January 2010 issue is out now. And, to boot, Aqsa News is free (which is a huge bonus especially as the JC executives are probably, at this moment, discussing when to push the JC’s cover price up to the £1.10 mark). Anyway, I digress. Aqsa News is 14 pages long and packed with content and devoid of annoying adverts. Aqsa News doesn’t waste its precious coverage on sport. But if you like your news slanted towards total condemnation of Israel and you want to see how its imminent destruction is coming along, then Aqsa News is the only paper to get a hold of. There are reviews of books by Ben White (Israeli Apartheid: A Beginner’s Guide) and by Jonathan Cook (Disappearing Palestine: Israel’s Experiment in Human Despair). There are numerous articles on the various firms and countries being targeted by pro-Palestine activists for doing business with Israel. Volvo, Brimar, Alstom and the German government are all taking a hit. Ahava is a funny one. Hands up if you knew that Ahava has a nice shop in Covent Garden. I didn’t until I heard that the pro-Palestine Campaign was going to protest outside it. I went down to the shop to have a look round and to see how business was. 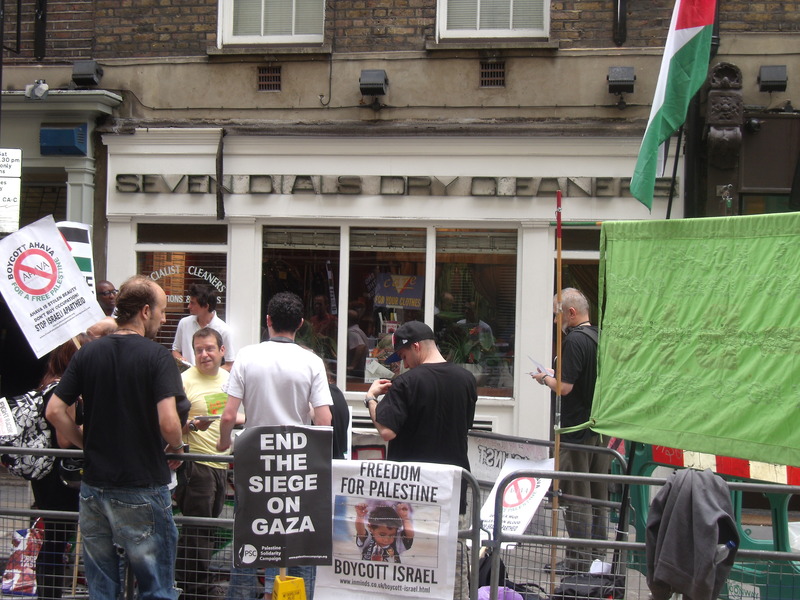 The manageress told me business was good, even better when there is a pro-Palestinian protest outside. However, the protests can be frightening for the staff working in the shop especially, as happened recently, protesters handcuffed themselves inside the shop while screaming abuse. Anyway, before I knew it I was persuaded to spend £31 on a Dead Sea Liquid Salt and a Dermud sensitive skin relief. Sadly, I spent the evening screaming my flat down when I seem to have over-applied the Liquid Salt. So, thank you to the pro-Palestine Campaign for making me £31 poorer, Ahava £31 richer and for causing me intense agony! There also some cartoons like that of Palestinians being arrested and assaulted by Israeli soldiers and another of a black South African woman consoling a distraught Palestinian woman in a cemetry. The UN has re-affirmed the right of Palestinian refugees to return to their homeland over 100 times, in accordance with international law. Apart from these two statements being highly controversial (and factually incorrect) it doesn’t sound like the author wants Israel to continue for too much longer. 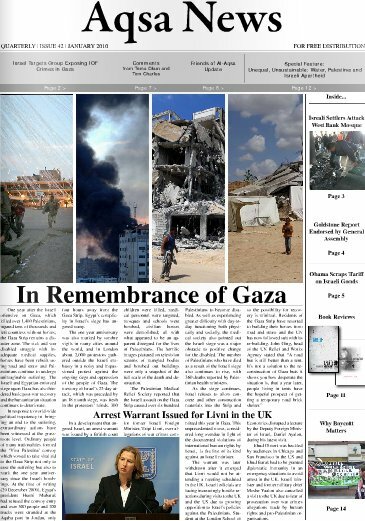 Aqsa News is available from, and helping to radicalise, all good British Universities near you now! 27th January is the day the death camp, Auschwitz, in southern Poland, was liberated. So the 27th is Holocaust Memorial Day worldwide, excepting, now, the British Parliament. There are ways to criticise Israel but using Holocaust Memorial Day is not one of them. Out of all the Holocaust survivors worldwide the shameless pro-Palestine campaign located one who inexplicably hates Israel, and everything it stands for, to the core. His name is Hajo Meyer. Born in Germany in 1924 Meyer survived 10 months in Auschwitz. Now he tours internationally speaking out against Israel and Zionism, the same Israel which if it had been created soon after the Balfour Declaration 0f 1917, and not 31 years later, would have meant he would not have seen his family and friends gassed to death. So how can a human being like this speak out against what would have saved so many lives? It is inconceivable, surely, that a man who has witnessed so much death and cruelty can criticise a notion that would have stopped all that suffering. 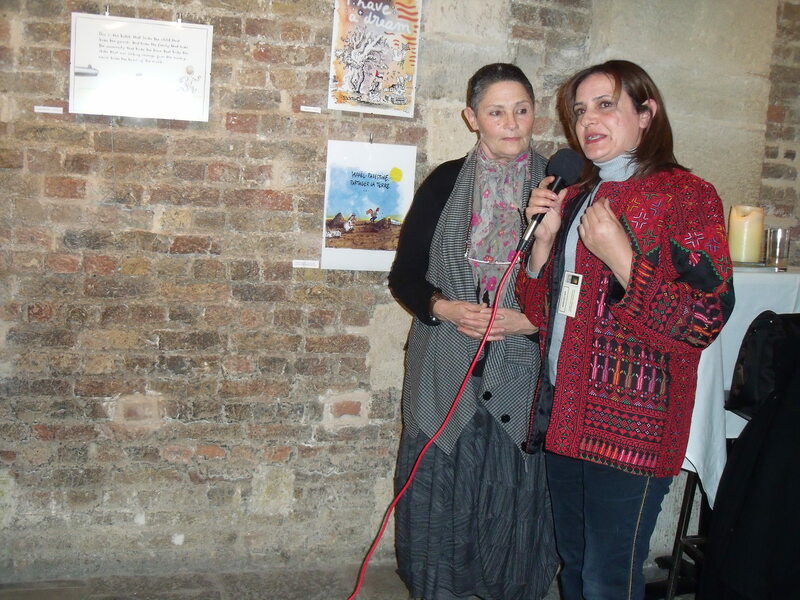 The pro-Palestinian campaign can have sympathy for the people of Gaza without equating Gaza to Auschwitz. But this equation is nothing more than implied Holocaust denial. 1400 Palestinians, some say much less, died during Operation Cast Lead. 1,500,000 died in Auschwitz. There are no gas chambers in Gaza. But that is of no concern to pro-Palestine campaign Holocaust deniers. Holocaust denial and anti-Semitism is on the increase. 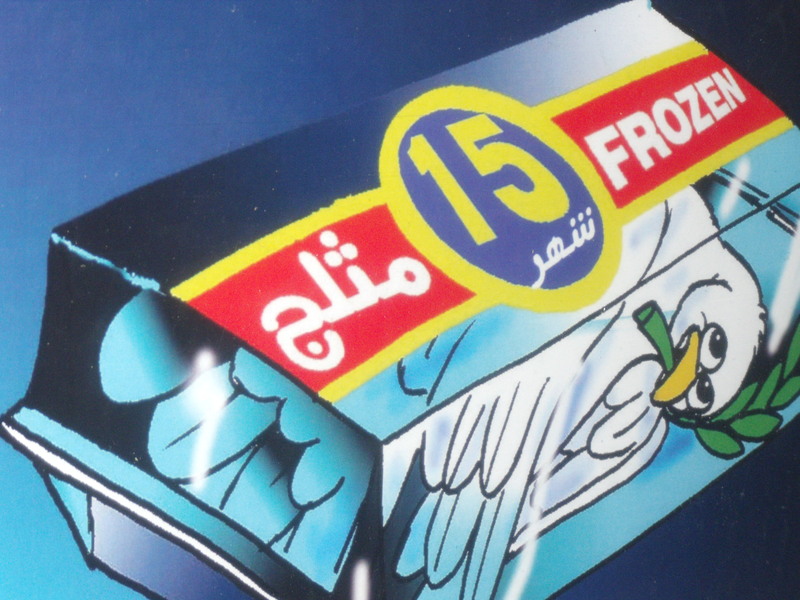 Yesterday, I had a Palestinian taxi driver who told me he doubted the figure of 6,000,000 dead Jews. He went on tell me how the Jews never integrate in the country they live in and how they all moved to the Middle East from Europe just to control the region. It was a 30 minute tirade specifically against Jews (not Zionists or Israelis). Totally ashamed, I had to agree with everything he said. I thought about questioning him but I realised that first, it was a lost cause, and second, he was dropping me home and might see the mezuza on my front door! “Jewish victims in central Europe had hardly any sympathy for Israel; Zionists picked and chose the best ones to escape to Palestine; Zionists had no sympathy for holocaust victims, they referred to them as “pieces of unusable material”. Whoever has ever picked up a book about Zionism will know that Zionism was about saving every Jew from discrimination, not seeing fellow Jews as “unusable material”. After Meyer we had a speech from Haidar Eid via telephone from Gaza who spoke about the “genocidal campaign” of the Israelis against the people of Gaza. There was no mention of the Egyptians who are also building a wall on their side of Gaza to keep Hamas out of Egypt. In the meantime five pro-Israel supporters had been evicted from the room by the police at the behest of Jeremy Corbyn MP, who had sponsored the event, for making a stand against the despicable speech of Meyer. 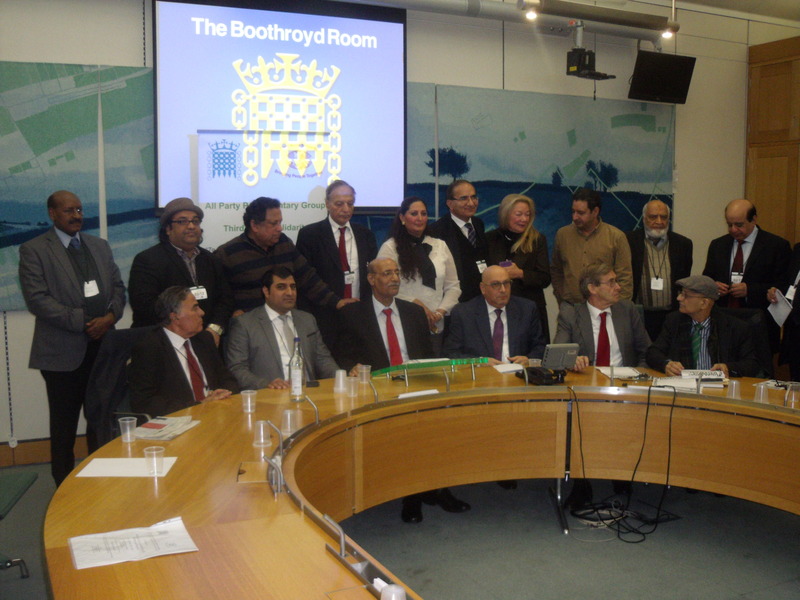 Here we were in Parliament listening to a speech that paints as total evil anyone that is a supporter of Israel. They were given no platform and had to make their voices heard and anger felt. Meyer’s biased rhetoric can only darken the view that people have of Israel and people like me, who support Israel and its right to exist. This propaganda is exactly the same type that my taxi driver was brought up on. To end the meeting the pro-Palestine campaign tried to make itself look reasonable by inviting various other people to speak about their own causes. Armenia, Sri Lanka, Haiti, Ireland and Africa were spoken about but the speakers were allocated a mere two minutes. The representative of Armenia spoke about the child genocide that was taking place every day in Africa; 3,000 children die each day there. This is surely more important than Gaza but then African children do not walk into cafes and blow themselves up killing innocent people like Hamas do. 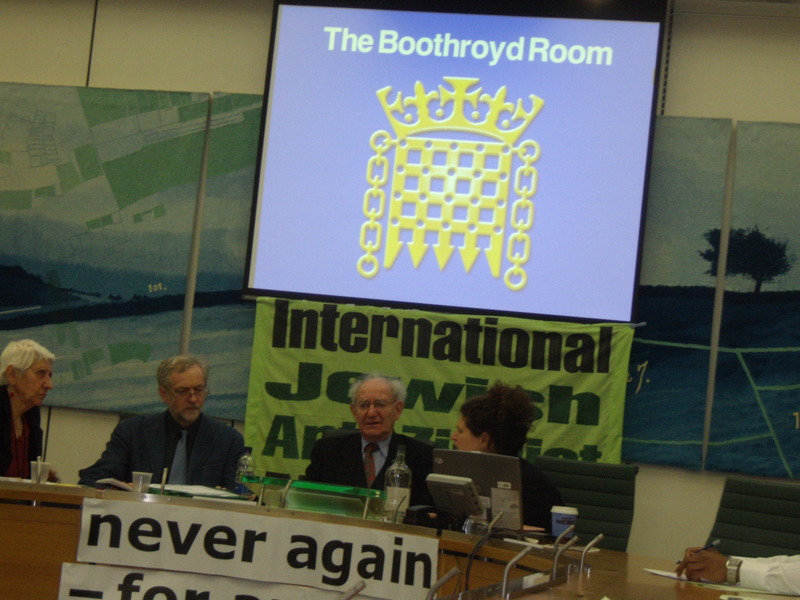 27th January 2010 can now be remembered as Holocaust Denial Day in our Parliament. 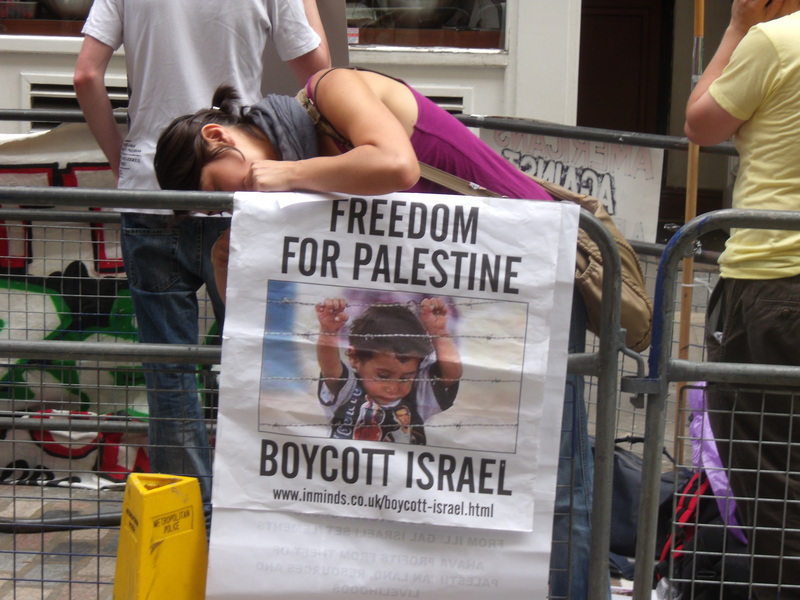 Imagine for one moment that the nasty Boycott, Divestment and Sanctions (BDS) supported by the Palestinian Solidarity Campaign and all of its supporters was a success. Israeli industry would be on the verge of bankruptcy and all of the innovations and inventions that are constantly discovered by Israeli scientists would not be discovered for lack of funding and investment. Like, for example, the Camera in a Pill that travels through the digestive tract sending back photographs of the intestines in someone’s body. There is now no need to use cables that are passed into the digestive system through the nose or mouth and which would normally require a patient to be sedated. Patients can now carry on their normal lives while a diagnosis of their condition can take place. All they need do is swallow the “Camera Pill” which is then excreted out after the 24 to 48 hours that the pill takes to go through the digestive system. You only have to glance briefly at www.israel21c.org to see the range of innovations produced by Israeli scientists that seek to improve people’s lives. The many innovations include using music therapy to help deaf and hearing-impaired toddlers, developing alternative energy sources such as solar and hydro power and an Iphone App for finding free Parking in New York. 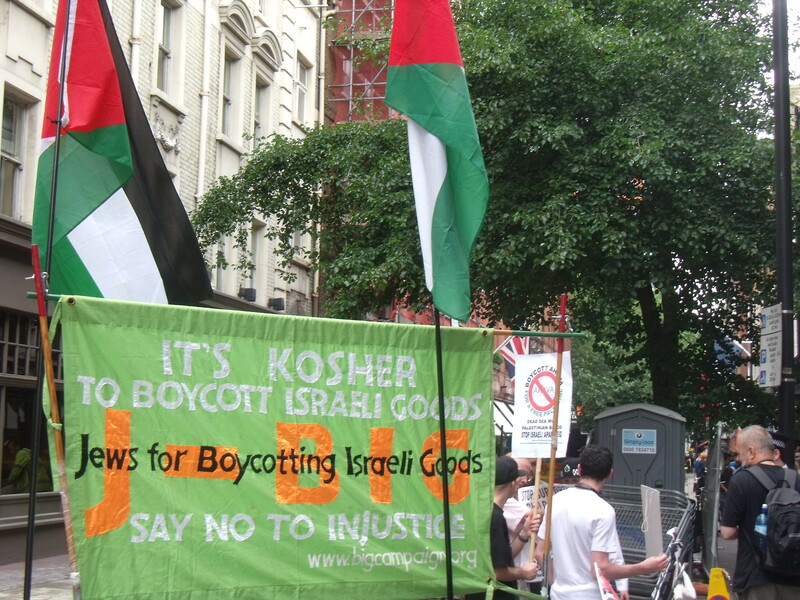 Yet, a successful boycott, particularly an academic boycott, would stop all this development in its tracks. One of the main aims of the sanctions is to “cut off trade and investments“. If an academic boycott succeeded then Israeli scientists would not be able to consult with international scientists over crucial developments. And then there is Haiti. It could not have escaped anyone’s notice that the reports on Sky and the BBC have focused mainly on the Israeli rescue team. The pictures and footage coming from this tragedy are too much to bear but Israel is doing its best to save those buried under the buildings and still just about alive. As soon as the quake struck last tuesday Israel prepared to dispatch a 220 man team on two El Al planes. The entourage brought with them a field hospital that can serve 500 patients a day and includes 40 doctors, 25 nurses, a children’s ward and an intensive care unit. Sanctions would have seriously reduced the effectiveness of Israel’s ability to save these lives. The rescue mission should impress on the Palestinians that Israel would go anywhere in the world to improve conditions and health, even as far as Gaza! The Israeli, British and all the teams are heroes for putting their lives at risk by going into terribly insecure buildings which could collapse any moment especially if the expected aftershocks occur. Even the church has not been immune from the ignorance. It recently divested from Caterpillar on the basis that Israel uses its bulldozes to demolish illegal Palestinian homes. The church made a recent ineffectual gesture by dumping its shares in Caterpillar even though Caterpillar could now be playing a crucial role in helping Israel’s rescue mission by using its equipment to move swathes of rubble to get to the dead and dying. But even as Israel does good the anti-Israel brigade will again attempt stir up an audience against Israel. 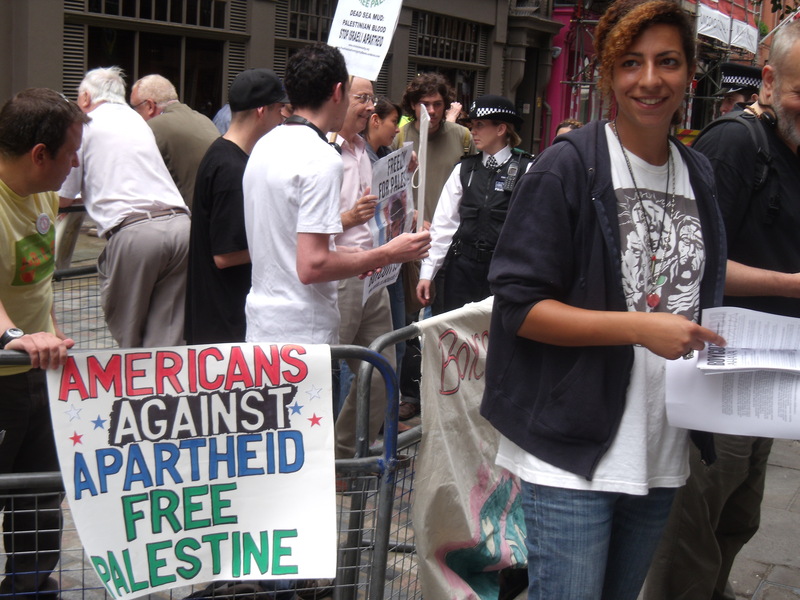 In London tomorrow night there is an anti-Israel meeting. It is at Conway Hall, Red Lion Square from 7pm till 9pm. You would hope that for one night the whole event could be turned into a “Help Haiti” evening. The hostilities against Israel could be resumed once every thing has been done to rescue Haitians. For Robi a highly evocative cartoon is that of an Angel and the Devil playing cards. Instead of chips they play for bodies. “Can you see who has won the most bodies?,” Robi sadly asks me.